The brave firefighters are on their way to put out a fire in their little firefighting cars. They have a lot of tools, like a ladder, fire axe and fire hose, to help them put out the blaze. 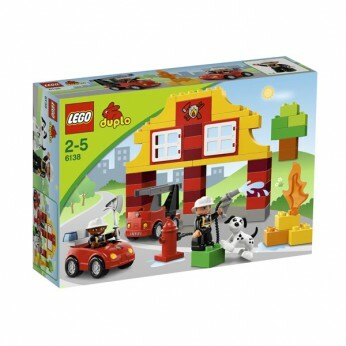 DUPLO bricks, figures and elements arecolourful, safe and sturdy for little hands and big imaginations…. The brave firefighters are on their way to put out a fire in their little firefighting cars. They have a lot of tools, like a ladder, fire axe and fire hose, to help them put out the blaze. DUPLO bricks, figures and elements are colourful, safe and sturdy, for little hands and big imaginations. LEGO model number: 6138: Includes Firefighter mini figures; For ages 2 years and over; EAN: 05702014794436. * 3974384 16.99. This toy costs approximately £19.99 (for the latest and best prices make sure you check our retailer list for the LEGO Duplo My First Fire Station 6138 above). In our review of LEGO Duplo My First Fire Station 6138 we classed it as being suitable for ages 6 years, 7 years, 8 years, 9 years, over 10 years but recommend you check the manufacturer specific advice before purchasing.